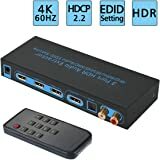 ✔ NEWEST 4 IN 1 OUT HDMI SWITCH - This HDMI switch designed with 4 input ports and 1 output port, you can choose the HDMI signal source by the IR remote control, easy to access. 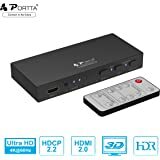 ✔ POWERFUL COMPATIBILITY - The switch can compatible with any HDMI device such as Amazon fire TV | Apple TV/ LE TV | PS3/4/5 Vedio Games | Macbook | VCD/DVD Plyer | IP TV/STB | Media Box | Camera | Xbox360 | Xbox one | Huawei Box | MIUI Box | Smart Box | Blue-ray Player Chromecast | PC/Computer | YUV 60Hz | RGB 30Hz | ROKU 4 | Wii U | SAT Receiver | Digital camera | Projector Tivo | Vizio. 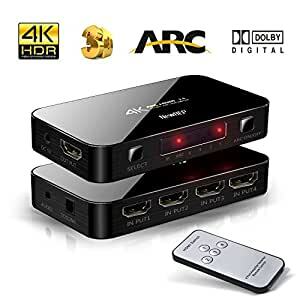 ✔NOTICE: It is better to connect the HDMI 4/RAC input ports while apply on TV (Also other HDMI input ports works). 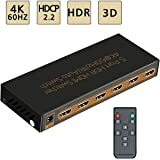 If there is no sound when connect others HDMI inputs, please restart this HDMI device again. 1. 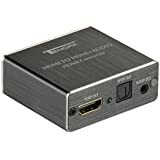 TOSLINK does not support Dolby Digital plus, please change the input source's audio output to a different setting, if needed. 2. If using TOSLINK cable, please make sure the rubber protective tip cover has already been removed from both ends before connecting them to devices. 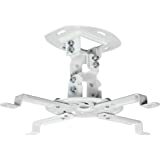 * Each port supports HDMI protocol input. This works well for our older tv with only two hdmi ports. We give multiple devices and this enables us to have everything accessible without changing plugs constantly. Works well with no lag. Very happy. 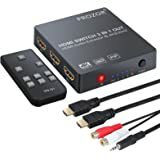 The speakers on my TV are very low quality and there are only two HDMI inputs and no TOS link out on it either, so I purchased this I use it to drive sound out to an amplifier via the TOS link or to some computer speakers using the 3.5 mm connection. Sound is great but there IS a noticeable delay between video and audio when used this way. Regular sound from HDMI does not suffer from this and I have learned to speed audio in Kodi by 300 ms to compensate. I now have the Raspberry Pi, the Blu-Ray player, the Chromecast and a Digital TV Box. I am thinking of getting another for the other consoles I have. Great buy! Works great. I hooked up my XBox One and Nintendo switch as HDMI inputs to the switch with the HDMI out going to my 4k monitor and the optical out going to my stereo receiver. Great solution since my 4k monitor only has 1 HDMI input.